Simply the best name in the industry with a reputation for quality, dependability, and award-winning designs to complement any gated entrance, our complete line of gate openers is designed to meet or exceed UL325 safety standards and requirements. The RSL12V residential and light commercial DC-powered slide gate operator is rated for gates up to 800 pounds and 25 feet in length, and has a built-in battery backup. 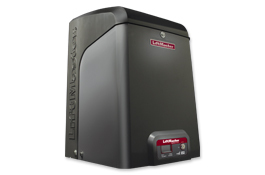 The LiftMaster® Elite Series® CSL24V is engineered for a million cycles in high-cycle, heavy-duty applications. It is rated for gates up to 1,500 pounds or 50 feet in length, and has a built-in battery backup. 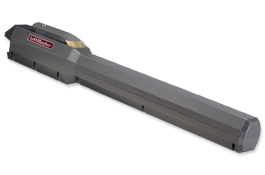 The VSL595 is designed for high security applications such as airports, manufacturing plants or other areas where securing an opening quickly is important. It is capable of opening gates at speeds up to 2.2 feet per second. The LiftMaster® SL595 is an extreme heavy-duty operator for industrial locations such as manufacturing plants and truck depots. The extremely powerful design supports gate lengths up to 90 feet and gate weights up to 2,500 pounds. 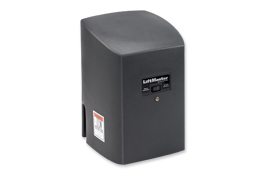 The LiftMaster® SL575 is a reliable continuous-duty operator for use on heavy-gate applications in commercial and light industrial locations. 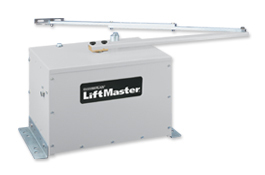 The LiftMaster® HS670 Heavy-Duty Operator is designed for commercial or industrial applications that require high cycles and large gates. A swing operator is used when a gate (or two gates) open inward or outward away from the wall. Our Swing Gate Operators range from light to heavy-duty depending on the size of the entrance and quantity of open/close cycles. The LiftMaster® Elite Series® CSW24V is engineered for a million cycles in high-cycle, heavy-duty applications. 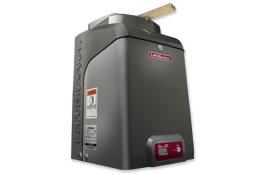 It is rated for gates up to 1,200 pounds or 18 feet in length, and has a built-in battery backup. The CSW200UL models of swing gate operators are the first choice for heavy-traffic applications such as large gated communities, residential developments, commercial complexes, and private estates. 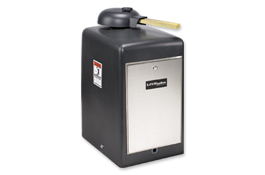 The LA100 is a DC-powered gate operator designed for residential single gate applications. It has a powerful 24VDC motor featuring soft start/soft stop operation, promoting longer gate and operator life. 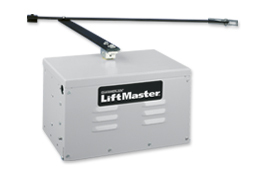 The LiftMaster® SW490 offers powerful performance for high cylce and heavy industrial swing gate applications. This hefty design supports gate lengths up to 22 feet and gate weights up to 1,000 pounds. 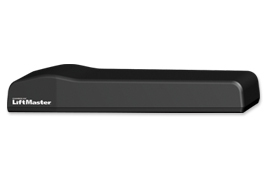 The LiftMaster® SW470 is a heavy-duty commercial swing gate operator for use in high-cycle applications such as gated communities and commercial access. Chamberlain's gate operator hardware includes wheels, guide rollers, hinges, and more, and is constructed using only the finest materials and processes available, ensuring the highest performance and lasting durability. Chamberlain® Elite Power Wheels™ are constructed of solid steel and are available in 4" and 6" sizes. They are finished with gold or silver zinc plating, making them ideal for heavy continuous cycle gates. We also carry non-breakable UHMW wheels designed specifically for lighter gates. Chamberlain® guide rollers are constructed from steel roller bearings and are covered with neoprene, making operation silent and steady. They are available in black or gray, in adjustable or side-mount styles. Covered Guide Rollers are also available to meet UL guidelines in select markets. Chamberlain® Elite Power Hinges™ are designed to last longer, install easier, and provide greater safety than conventional gate hinges. They are designed for high-traffic industrial applications and have an innovative safety design that prevents the gate from ever hitting the post. 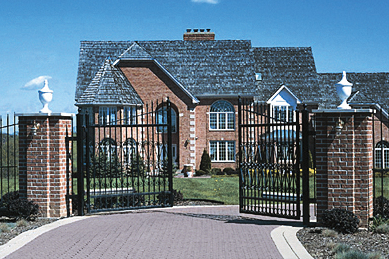 Expand and customize your gate access system with Chamberlain's extensive selection of innovative gate operator accessories designed to bring added safety, security, and convenience. Chamberlain® offers both in-ground or pad-mount gooseneck style posts for your varying installation needs. All our posts have a powder coated, weather-resistant finish, and our new pedestals have versatile mounting plates, offering more mounting options. Strong and reliable protection on both pedestrian and vehiculer gates, Chamberlain's magnetic and electric gate locks are constructed with heavy-duty stainless steel and offer superior reliability, strength, and safety. Chamberlain® offers 7-day timers that can be used to automatically open or close a gate at a pre-programmed time. Features include automatic daylight savings time changeover, holiday programming, battery backup, and up to 42 programs. Essential for added safety, Chamberlain® fire access boxes provide a convenient way for the fire department to gain access to the property: the gate can be activated automatically with a switch or a pull cord. Chamberlain® offers a variety of loop accessories to meet all of your loop needs. From 12VAC/VDC to 115VAC, Chamberlain® offers loop detectors that provide all the features and controls necessary for a wide variety of gate operator applications. 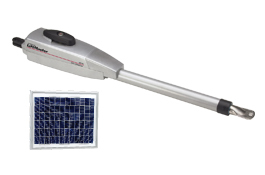 Chamberlain's new low-power loop detectors' consumption rate is so low they are perfect for solar- or battery-powered gate operators. Chamberlain® pre-formed loops are available in two styles: pave-over style, which is used for new drive installations, and saw-cut style, used on existing drives. Both styles are available in 4'x8' and 6'x12' loop sizes. Chamberlain's 18AWG XLPE bulk loop wire is ideal for installers that prefer to make their own pre-formed loops. The wire is available in black, blue, or red in 500- or 1,000-foot spools. Chamberlain­® offers high-quality loop sealants and a professional loop sealant gun. Loop sealant is available in black or gray, and skins over in 10 minutes and restores traffic in only one hour. Our gun dispenser is drip free and has a revolving barrel, making it ideal for caulking around corners. Chamberlain® offers a variety of vehicle detection systems to fit your specific gate operator needs, including photo eyes, electric edges, and sensing probes. Photo eyes provide much-needed safety around gates by reversing or stopping the gate when something is in its path. Chamberlain® offers both retro-reflective and emitter-receiver type photo eyes. Chamberlain® offers a variety of quality electric edges for gate installations. Electric edges should be used on every gate for the protection of pedestrians and vehicles. Chamberlain® Sensing Probes can be used to open a gate when a car drives by or to indicate that a car is approaching, sensing a 15-foot diameter around the probe.